It was during the long wet winter months on the Peninsula that I began daydreaming.... It was then that I decided how I would spend my summer inside the Olympic National Park! Countless hours were spent studying maps and satellite images during the winter. While the relentless rain beats down on the lowlands during winter, snow accumulates in the mountains. The highest points of the Olympics are estimated to get up to 50 feet (18 meters) of snow! Because of this, it is normal that my fellow backpacking friends and I are forced to wait until late spring for the snow to melt so we can begin our journeys through the mountains. Planned 30+ Days in the Olympic National Park pre-trip map. This is what I planned to hike, but the journey would have other plans. I will be doing most of this route solo and fully self reliant. In order to have enough food, I would send myself supplies using the Postal Service to resupply after two weeks. I would use public transportation through the adventure, to get me into towns for food and other supplies. My exact path was not set in stone and I would bring an extra 7 days worth of supplies so that I could be flexible with my schedule. One of the main lessons learned by the end of the summer was that all the extra food was overkill because food was readily available in town (in Port Angeles, Forks, Quinault) as long as you're not picky or looking for specialty foods. Once all the planning and prep work was done I set out on my grand Olympic adventure that would go from August through October. Below I have all of the routes I accomplished along with the details, the stories, and some pictures that definitely don't capture the raw beauty of the Olympic wilderness. Need help planning your adventure? 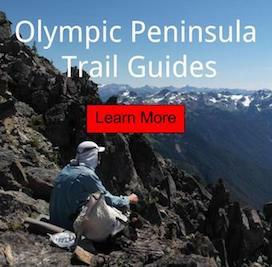 Check out my detailed Olympic National Park overnight hiking guide. Northern Bailey Range Traverse - First we got dropped off via bus at Lake Crescent. Then began up and over Aurora Ridge to jump on the start of the Bailey Range Traverse. This traverse is more remote than most alpine traverses in the US. It was made famous mostly by Herb Crisler; who shot an old film published by Walt Disney named Olympic Elk in 1952. Elwha to Quinault Trail - After shoving my face and picking up more supplies it would be time to start heading South again. My goal on this section was to visit remote lakes in the deepest interior of the park and get a glimpse of a meteor shower. Quinault to Lacrosse Basin to Dosewallips - After my second resupply I did another adventure on the South side of the Olympics. This time we would be walking up the East Fork of the Quinault river towards Enchanted Valley and then climbing up into the alpine and exploring high lakes with fantastic glacier views. Then we came down the Dosewallips and hitchhiked to town for resupply. Grand Valley to Dungeness - For this section I would be joining a group of hikers on their annual backpacking trip. We would start near Hurricane Ridge, then down to the gorgeous Grand Valley lakes, then over a series of mountain passes, and then finally down the Dungeness drainage to get another resupply. Continued Bailey Range Traverse Solo - After a few days off the trail I would pack my bags and jump on a bus to the Sol Duc Road. From here I would start my journey into the heart of Olympic National Park. Being solo off-trail and seeing numerous bears would test my mental capacity and be somewhat of a spiritual expedition. Return into the Bailey Range Via Dodger Point - After resupply in Port Angeles I would meet another friend and we would head back into the Olympics. This section would be more of a relaxing decompression after my intense solo trip. The objective was to find Herb Crisler's cache. Sol Duc High Mountain Loop - After meeting in Port Angeles again I would meet a different friend and venture up the Sol Duc. During this trip we would view Olympic Elk in full rut. This would be one of the highlights of the whole adventure. Make sure you read my thoughts at the conclusion of this adventure.